Alyxia usually grow as shrubs with whorls of small leaves that are slightly prickly to the touch. They develop small red or orange fruit that are often joined together in short ‘chains’ or in connected lumps. 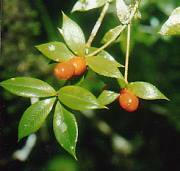 They are found in rainforest, monsoon forest, coastal heath and vine thicket in eastern and tropical Australia and Asia. They are very common in the rainforest understory along the tracks at Mossman Gorge.